Posted on April 27, 2014 by Peter Schilling Jr. Hot Blood review by Trylon theater manager Nikki Weispfenning. Our Nicholas Ray retrospective is almost over, and what have we seen? Lynching! Police brutality! Murder during wartime! 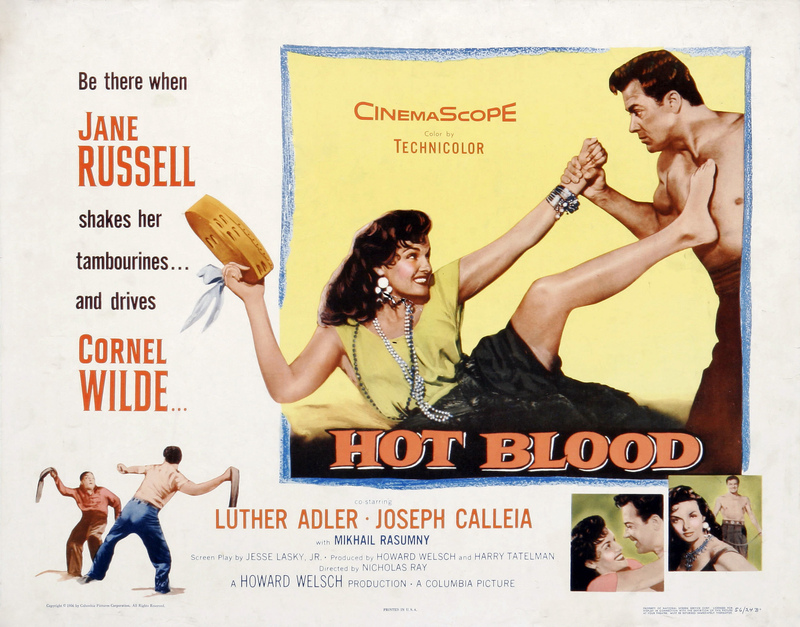 Before we get back to the serious problems of the juvenile delinquents in Rebel Without A Cause (screening at the Heights on May 8), let us take a moment to enjoy the lighthearted respite provided by Hot Blood. Initially titled No Return, Hot Blood was intended to be a study of the Gypsy subculture in New York City – a movie based in the realities of a marginalized ethnic groups with customs and rituals that were foreign to most Americans at the time. Nicholas Ray’s ex-wife Jean Evans was researching a book about the Gypsy community on the Lower East Side, and based upon her research, Ray (with the aid of a young screenwriter, Walter Newman) wrote a film treatment in 1951 – a serious drama with a dark ending. The film that Nicholas Ray actually made in 1955 was far removed from his original concept. Instead of a gritty movie about a real ethnic minority, Hot Blood became a quasi-musical, replete with dancing, elaborate sets, and garish costumes. And although most people involved with the production have spoken disparagingly of Hot Blood, the movie is very charming. Jane Russell is radiant here – a Hollywood star in top form, easily stealing scenes from the male leads. The dance numbers are dynamite! Color saturates the screen! Hot Blood is not the movie that Ray set out to make, but it is a lot of fun. Nikki Weispfenning lives in South Minneapolis with a handsome cartoonist, two black cats she met in suburban Virginia, and a very large puppy. She enjoys trashy detective fiction, river roads late at night, and obsolete technology. Hot Blood is screening Monday and Tuesday at 7:00 and 8:45. Purchase tickets here.